When Mitch Wheeler left his hometown of Bridgewater for a career in the U.S. Air Force, he couldn’t wait to leave the small Aroostook County town where he had thus far spent his entire life. PRESQUE ISLE, Maine — When Mitch Wheeler left his hometown of Bridgewater for a career in the U.S. Air Force, he couldn’t wait to leave the small Aroostook County town where he had thus far spent his entire life. Fresh out of high school in the early 1990s, Wheeler never could have guessed that more than 25 years later and after nearly two decades in law enforcement he would receive a college degree from the University of Maine at Presque Isle and become a physical therapist assistant. 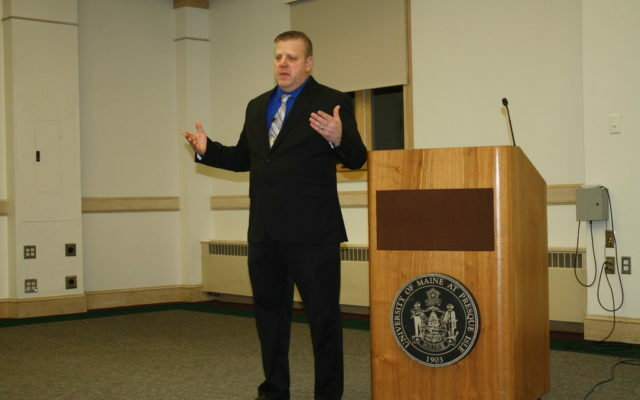 Mitch Wheeler, a 2017 graduate of the University of Maine at Presque Isle’s physical therapist assistant program, recently spoke about his journey from a career in law enforcement to one as a PTA during a special distinguished lecturer event at UMPI. But when Wheeler stepped off the airplane in San Antonio, Texas, the reality of his new life hit him just as hard as the 90-degree heat. He was far from home for the first time, interacting with people he did not know and was not used to the harsh instructions and commands from his staff sergeants. Thanks to support from his parents and friends back home, Wheeler graduated from Air Force training and went on to serve at now defunct Griffiss Air Force Base in New York. He pursued his interest in law enforcement by working for the Security Forces branch of the Air Force. Wheeler later took an Air Force position in New Mexico, for which he still cannot disclose the job duties because they involved high-stakes government operations. It was after he was called upon to save a civilian’s life while off duty one day that he felt compelled to pursue a new career as a police officer in Maine. Although he initially wanted to return to Aroostook County after leaving the Air Force, Wheeler accepted a position as a police officer in the town of Cumberland. Throughout his 17 years in law enforcement he also worked for the Yarmouth Police Department, the Presque Isle Police Department and the Aroostook County Sheriff’s Office. 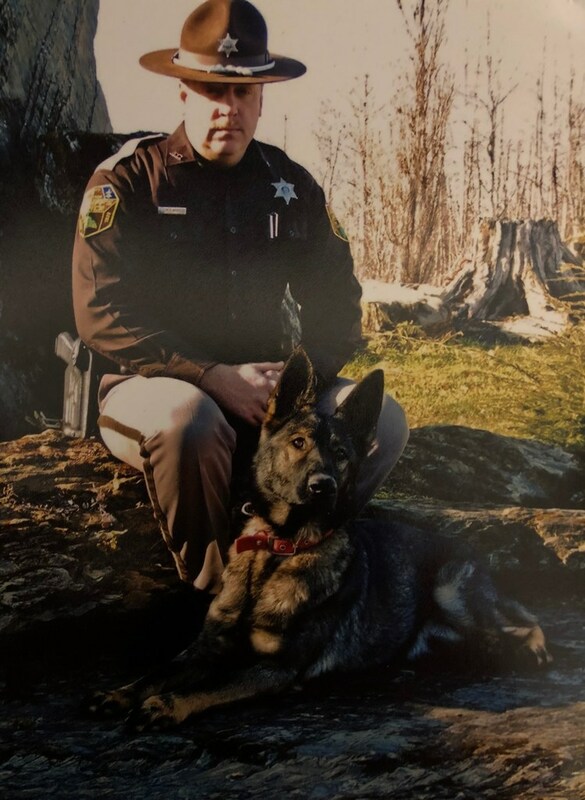 During his time as a deputy and K-9 handler for the Sheriff’s Office, Wheeler formed a deep bond with his canine partner Max and colleagues and knew he was making the difference he wanted to make for his community. But as the years continued, changes in administration resulted in many budget changes, including the elimination of the K-9 program. As Wheeler spoke to a crowd of around 20 individuals at UMPI — including family members, friends and fellow students and alums — he recalled how over time he began to enjoy his position in law enforcement less and less. While searching new career options, he recalled something that his father — former Aroostook County Sheriff Edgar Wheeler — had once told him. In 2015 Wheeler discovered that UMPI had an associate of science in physical therapist assistant program, which helped renew an earlier interest he had in pursuing the career field. Nine years before, Wheeler had injured his back and went through physical therapy at Northern Light A.R. Gould Hospital, known then as The Aroostook Medical Center. His therapist, Michelle Slike, had mentioned that he might do well as a PTA. At the time, UMPI had not yet established its two-year PTA program and Wheeler did not want to uproot his family with a move to Bangor, where the nearest program was located. But years later Wheeler was more than ready to pursue a more rewarding career path despite the challenges of having been out of high school for two decades. For Wheeler the biggest challenges of returning to school were learning how to form regular study habits and persevere through the complex PTA curriculum, which included courses in therapeutic exercise, neurological interventions and data collection. He gives much credit to all his professors, including PTA faculty members Vanessa Patenaude and Chris Rolon, and his fellow students for their guidances and support. Wheeler graduated from UMPI in 2017 and now works as a PTA at Cary Medical Center in Caribou, where he also completed his clinical training during his final semester. The fact that he has succeeded in his new career is no surprise to his longtime friend Scott Rusby, of Bridgewater.